Recently, The Savvy Newcomer team was discussing what valuable ATA resources we could spotlight here on the blog. 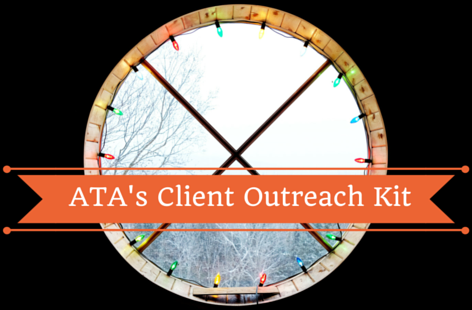 If you are an ATA member and are interested in growing your direct client business and/or are interested in client outreach and PR efforts to boost the whole association and profession, then at least consulting the Client Outreach Kit should be a no-brainer. Even if you aren’t an ATA member, you can still read through some great advice and guidelines summarized on the web page without actually downloading the kit. However, you must be an ATA member to download the full kit (consisting of a customizable PowerPoint presentation for use at speaking engagements). One of the points emphasized from the get-go if you click on the link above and read through the summary is that you need to take a completely different approach in your marketing tools for direct clients as opposed to for agencies. Therefore, it is important to keep in mind that you may need to make some changes in order to take full advantage of the kit. You can check out the skills modules for more detailed guidelines on how to engage in client outreach and get the most out of the kit. If you click on the “Getting invited to speak” skill module and scroll down to the bottom, you will find the example of a real story about an ATA member who decided to branch out and begin a series of workshops about translation and multilingual marketing in her local community. There is also a full article in the ATA Chronicle from 2009 about this story, which is a good read. The customizable PowerPoint presentation available to ATA members contains some basic but fundamental information on the language industry, as well as talking points for speaking engagements, making it a great tool for anyone interested in reaching out to their local community to find potential direct clients and advance the status of the translation industry. We are glad we volunteered to write this blog post to give ourselves a nudge to read through the kit again. If you have any thoughts or experiences in relation to the kit or client outreach, write a comment on this post! We are confident that it would be highly beneficial for translators to discuss this topic. So what are you waiting for? Looking forward to hearing from you and we hope you enjoy using the kit. I’m specialized in tourism and hospitality and am going to submit a proposal to speak about the importance of translation at a hospitality summit in Greece this spring. Thanks for the reminder about this great resource- I will definitely check it out! That sounds like a perfect opportunity to use the kit! Be sure to let us know how it goes, and best of luck.